Research and analysis of a number of primary sources provides an illuminating and valuable insight into the power dynamics at play and the relationship between federal regulators, cabinet ministers and corporations controlled by media proprietors. These primary sources include copies of documents and correspondence that are available in this website’s ‘Document Archive’, including copies of several documents that were formerly stored in CRTC file 1000-121 and which were destroyed on 27 March 2006. The case study starts by describing how I first became aware of the significant corporate influence on the CRTC in the early 1990s, while employed in the Canadian broadcasting industry. However, I only realized the extent of the CRTC’s regulatory capture by industry interests in early 1995, after reviewing regulations that had been enacted a year earlier by the federal regulator, including subsection 18(6.3) of the Cable Television Regulations, 1986 – which I refer to as ‘Regulation 18(6.3)’. The history and precise mechanics of the highly unorthodox wealth redistribution scheme facilitated by Regulation 18(6.3) is addressed. This regulation gave cable television companies the option to charge artificially inflated monthly rates to subscribers for their monopoly service, siphon revenue out of the Canadian broadcasting system and cross-subsidize other commercial activities if money was simply donated to a fund subsidizing television production companies. In effect, Regulation 18(6.3) granted several prominent businessmen the unprecedented power to require six million citizens to subsidize private companies, including the unjust enrichment of corporations under their respective control. Furthermore, CRTC commissioners sanctioned cable television companies to collect the Regulation 18(6.3) fees under false pretences, a method of collection that I’ve described as “government-regulated fraud” (Mahar, 13 June 2008). Facts are presented which support the theory that Regulation 18(6.3) was part of a larger government agenda to accelerate the development of the so-called ‘information highway’, including by federal regulators abusing the authority of the CRTC to artificially inflate rates for regulated services and permitting corporations to use this extra revenue to cross-subsidize the cost of building their privately-owned digital networks. It is a matter of record that I first objected to this transfer of wealth agenda and advocated for an investigation 20 years ago (Haslett Cuff, 8 March 1995; Mahar, 17 March 1995). A culture of corruption at the CRTC and political complicity emerged following a Parliament Hill press conference that I conducted with my legal counsel and three MPs to address the wealth redistribution scheme on 29 March 1995. Evidence includes the federal regulator’s ‘official statement’ about the Regulation 18(6.3) affair containing false and misleading information (CRTC, 29 March 1995), related questions in the House of Commons to Prime Minister Jean Chrétien being left fundamentally unanswered (Hansard, 30 March 1995) and the failure of the government to publicly review the matter – despite the nature of the scheme and the existence of legal opinions that Regulation 18(6.3) was probably unlawful. A pro bono legal team helped me initiate a strategic lawsuit against Rogers Cablesystems Ltd. in May 1995 to establish the legal right of ratepayers to notice about Regulation 18(6.3). CRTC Chairman Keith Spicer subsequently provided false and misleading testimony about Regulation 18(6.3) to the House of Commons Standing Committee on Canadian Heritage. While the corporation won a precedent-setting decision on jurisdiction to stop the court from ruling on the merits of my case, I was designated as a public interest litigant by Justice Sharpe, who made a precedent-setting decision in my favour on costs, stating that my case was “brought on a bona fide basis [and] raised a genuine issue of law of significance to the public at large” (Mahar v. Rogers Cablesystems Ltd., 1995, p. 705). I initiated a complaint to the CRTC pursuant to s. 12 of the Broadcasting Act, alleging unlawful activities by the CRTC and cable television companies in relation to Regulation 18(6.3). The Public Interest Advocacy Centre subsequently made a request to the Minister of Canadian Heritage for the government to “swiftly take steps to initiate an independent review” of the complaint (PIAC, 30 November 1995). However, the Hon. Michel Dupuy dismissed the request. Similarly, Finance Minister Paul Martin and Industry Minister John Manley also dismissed my requests to intervene in the matter. In an unpublished decision, the CRTC ruled itself and corporations innocent of unlawful activities in relation to the complaint about Regulation 18(6.3), following a closed-door process that included the participation of Rogers Cablesystems Ltd. and the industry association, but did not permit the involvement of any government-funded consumer group. According to the CRTC decision, Parliament had granted the CRTC the authority to enact Regulation 18(6.3); corporations were entitled to collect fees related to Regulation 18(6.3); but the citizens paying these fees were not legally entitled to direct written notice about Regulation 18(6.3). Documents related to the matter were stored in CRTC file 1000-121, but I was not in a position to challenge the unpublished decision in the Federal Court of Appeal, as my mental health had deteriorated. Consequently, it remains an open question whether the CRTC and corporations acted unlawfully. The CRTC proposed to replace the Cable Television Regulations, 1986 with the Broadcasting Distribution Regulations, effectively eliminating Regulation 18(6.3) in name, but incorporating a modified wealth redistribution scheme into the new regulations that would increase the unjust enrichment of Rogers Cablesystems Ltd. in the process. The federal government became a partner in the wealth redistribution scheme on 9 September 1996, when Deputy Prime Minister and Heritage Minister Sheila Copps announced the creation of the Canada Television and Cable Production Fund, a ‘government-industry partnership’ to subsidize production companies from both taxpayers and cable television subscribers. MP Dan McTeague and I subsequently appeared together at a CRTC public hearing and identified several fundamental deficiencies inherent within the proposed Broadcasting Distribution Regulations, including the unjust enrichment of corporations and the violation of government policy. One month after that hearing, I required hospital care as a result of experiencing psychosis. The Broadcasting Distribution Regulations came into force at the start of 1998, entrenching the requirement for millions of citizens to unjustly enrich and subsidize private corporations through artificially inflated rates for cable television service. The Canada Television and Cable Production Fund was re-branded as the Canadian Television Fund that same year, after controversy that the government-industry partnership was subsidizing the production of television programming for foreign markets. MP Dan McTeague commissioned me to research how to reform the CRTC, resulting in a joint submission in 1999 to the Liberal Caucus Group on the CRTC. In addition I contributed to Bill C-381, a private member’s bill introduced to Parliament by Mr McTeague to amend the Canadian Radio-television and Telecommunications Commission Act, which died on the order paper when an early election was called in 2000. The following year I migrated to Australia. I returned to the ongoing issue in 2004, submitting information and documents to Prime Minister Paul Martin. However, there was no public review of the CRTC scheme. Analysis of primary sources starting in 2006 identifies that the wealth redistribution scheme, the culture of corruption at the CRTC and political complicity continue to be contemporary issues in Canada. 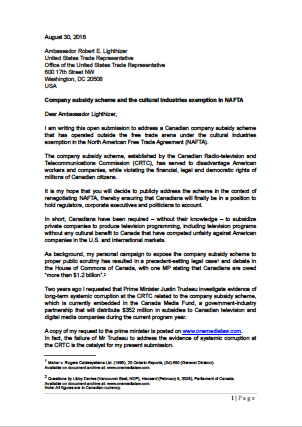 The data studied in this chapter relies upon a number of documents, including correspondence to Prime Minister Stephen Harper, CRTC Chairman Jean-Pierre Blais, former CRTC Chairman Konrad von Finckenstein and others. It is noted that CRTC file 1000-121 and all of the documents stored in that file were destroyed in 2006, after my lawyer sent information to Mr Harper about the outstanding case of corruption, the unpublished CRTC decision and identified the existence of CRTC file 1000-121. Copies of relevant documents are available on www.onemedialaw.com, including correspondence from the Office of the Prime Minister and the unpublished CRTC decision. When my campaign resulted in the NDP’s deputy leader Libby Davies stating in the House of Commons that Canadians are owed “more than $1.2 billion” as a result of being overcharged by cable television companies, the Hon. Jim Abbott misled Parliament by stating that the Harper government had referred the matter to the CRTC (Hansard, 8 February 2008). 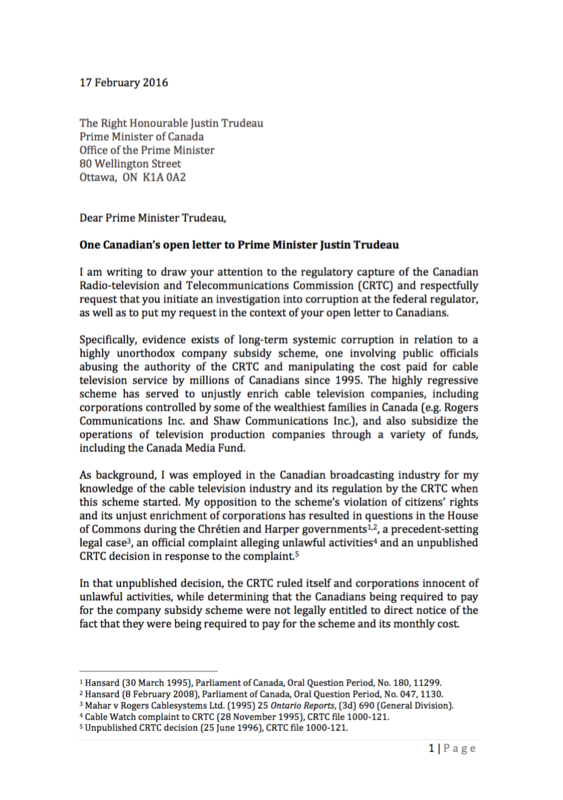 The Canadian Television Fund was subsequently expanded and re-branded the Canada Media Fund, and the prime minister did not grant me an opportunity to testify about the CRTC affair on the public record, as I requested through my lawyer.